There is no question a lot went right at Tony Macaroni yesterday for Rangers. Sure, it wasn’t a stellar display but it was good enough and got a vital job done, aided and abetted by a return to the working system which so clinically destroyed Celtic a month ago. However, one man will feel distinctly hard done by as a result of the changes yesterday, and we have to express a significant deal of sympathy for him, and praise for his general conduct. Andy Halliday found himself inexplicably dropped to the bench, where the previously unfavoured Borna Barisic, who had done little professionally-wise to merit a selection, took his place at left back. While the Croat went on to have a pretty decent match, Halliday will be justified at feeling more than a touch short-changed to have been benched, given the impressive performances he’s delivered at LB, not least of course against Celtic. He was even one of our better players against Kilmarnock, not that this is saying much, but there is little doubt Halliday had justified his place, even in the face of the competition from a Croat international. A number of fans even considered he was our first choice now, regardless of the summer signing from Osijek, but Gerrard’s ruthless dropping of him to the bench yesterday really was unexpected and clinical. Was it the right call? Barisic played well, yes, and that left foot is extraordinary, but we can’t help feeling we’d have preferred Halliday to have been dropped when he actually deserved to be. If you’re playing well, in form, and contributing enough to justify your place, does it send out the right message to be ditched in favour of a player your manager publicly castigated only a few days earlier? Ultimately it worked – Stevie’s veiled threats towards Barisic clearly worked and he probably is now our first choice left back – we have no issue with a Croat international with one of the best left pegs in the SPL being our main choice at LB. We just do think Halliday deserved a little better than to be so unceremoniously dumped. One thing we’re certainly learning about Gerrard’s management – he can be extremely ruthless. 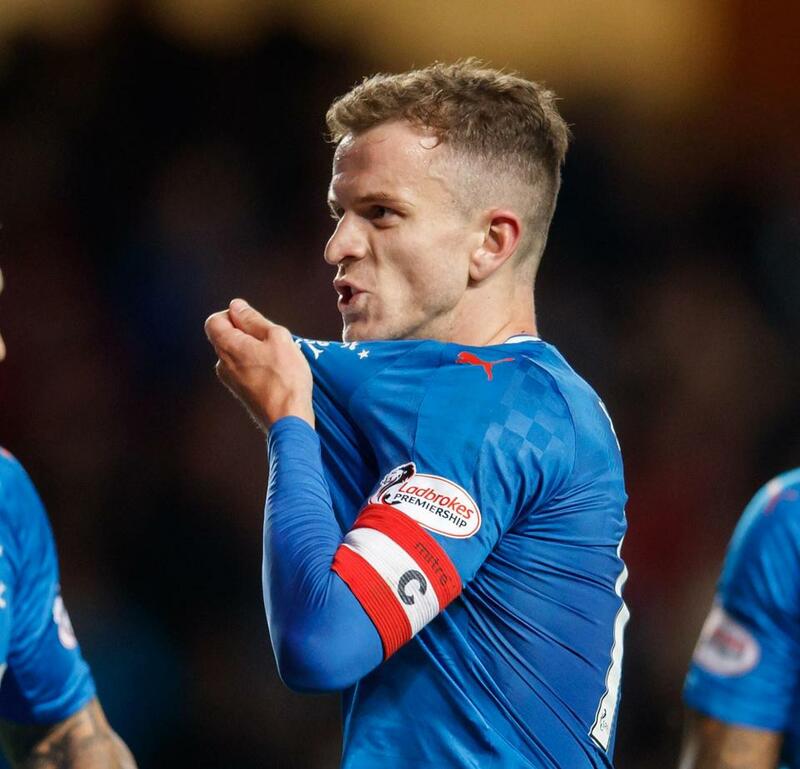 He’s been brutal towards Cummings, Docherty, Windass, Katic, and Lafferty to name just five – and he has the mental strength to stand by his convictions, however clinical they are. As long as it is to the benefit of the team we shall not grumble, but on a sentimental level, Halliday can certainly feel a touch aggrieved. But we’re sure he’ll cope with it as long as the results justify Stevie’s actions. I love Halliday and have always backed him on here but he knew barisic was always going to be 1st choice for LB when fit and focussed. Halliday will always be the unofficial captain and will play a huge part at LB/midfield and just as importantly..off the field! Don't get it, Halliday has been torn to shreds by folk saying not good enough for a long time and now being paraded as competition, out of position against a really good player in Barasic. Make you minds up. Halliday is true blue but is limited in skill simple as that. Love for the club only goes so far and eventually he will return to the player deep down we all know he is. "inexplicably dropped"? Really?! Thought it was obvious that BB is a far superior player than Halliday, full stop. Halliday would never be in my starting 11 unless we seriously had to. Wallace should be starting before him too. Halliday was not "unceremoniously dumped", He is well aware he is a squad player and fills in when need be. I respect the fact Andy is a Rangers man and does bleed blue blood like us all. But he is just not the Rangers standard of player that we need in the starting 11 that would win us the league. Barasic is that player! Really !!!! what games have you been watching, Barasic is the best LB we have had in many a year, yes he has had injury problems, but hopefully they are behind him. Yes Andy had a great game against them, and is a true blue, but he is limited in skill and is not a LB. Do you really want to stick with inferior players until they mess up. That's not the road to success. You play your best players when they are available and Barasic is easily our best left back. It may seem harsh on Halliday but he has already played more games than he could ever have imagined. He is a squad player and will get a game here and there as he probably expected. In truth if we want to be better than we are at the moment then he won't even be that next season. Making a bit much of it IN. Barasic is the best leftback at the club and should start every game he possibly can. After that It should be Wallace who is also superior in LB than Halliday. No mystery, not inexplicably dropped, just making way for a better calibre player.